Adapter used to interface coaxial cable with waveguide is referred as coaxial to waveguide adapter. The rectangular waveguide are fed by means of coaxial probe pierced into the wall of the waveguide. 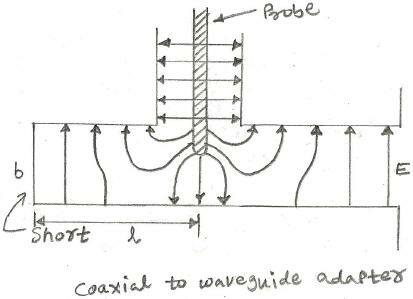 The coaxial probe is connected to source of EM waves. To generate TE10 mode, probe is inserted perpendicular or parallel to the maximum E field. The probe depth(d) in waveguide is kept smaller so that constant current on the probe will radiate EM field inside the waveguide structure. Probe diameter is also kept smaller to avoid generation of higher order modes. To have radiation only in one direction, short circuit is placed at a distance(l) equal to quarter wavelength in the backward direction. As shown in the figure,both d and l are chosen such that input impedance of the probe can be made pure resistive equal to characteristic impedance of the coaxial line. As shown in the figure E fields are perpendicular in both coaxial cable and waveguide structure.